Along with the staff at the Ohio Valley Educational Cooperative (OVEC), they began asking students what they wanted out of their education. From those discussions iLEAD Academy was born. iLEAD Academy is a regional high school serving students from the five county school systems. It’s designed to give students relevant learning, access, opportunity and employability. While only in its third year, the school is already having an impact on students in the region and has earned KSBA’s Public Education Achieves in Kentucky (PEAK) Award. The PEAK Award, given twice yearly, was established in 1997 to focus statewide attention on outstanding public school efforts that enhance student learning skills and promote the positive impact of public elementary and secondary education in Kentucky. “Great board and district collaboration! Increasing access and opportunity for all students across district lines – marvelous work!” wrote Erlanger-Elsmere Superintendent Dr. Kathy Burkhardt, who was a PEAK judge. Each of the five districts contributes equally to iLEAD’s operation. Each district contributed $75,000 during each of the first two years. The amount increased to $95,000 for 2017-18 due to the expansion of the school. iLEAD also received $250,000 from the Kentucky General Assembly in the 2014 state budget and has received contributions from others, including AT&T, R.J. Durr Foundation and Verizon. “I’m impressed that five small rural counties could come together to fight poverty and low educational attainment. To go outside the traditional classroom and involve outside organizations for financial assistance,” wrote PEAK judge Mona Vice, chairwoman of the Nicholas County school board and member of KSBA’s board of directors. Each year, each district can send nine students to iLEAD’s freshman class. iLEAD, which currently has 33 juniors, 27 sophomores and 39 freshmen, has a capacity of 180 students. Each student remains a student of record at their home district. “It has exceeded my expectations for Owen County to have that many students applying to go and staying there as students. It has been a good initiative for our district,” said Owen County Superintendent Robert Stafford. “The students that are juniors now, they really helped us pioneer this idea that we had and gave us feedback around the curriculum platforms that we’re using and things that worked and things that didn’t work. I think we’ve tried to listen to them and make adjustments that needed to be made and we’re continuing to do that,” Stafford said. Students take core academic courses online and progress at their own pace to college readiness in two years. iLEAD’s freshmen are able to take classes in the local area technology center to help determine a career pathway. 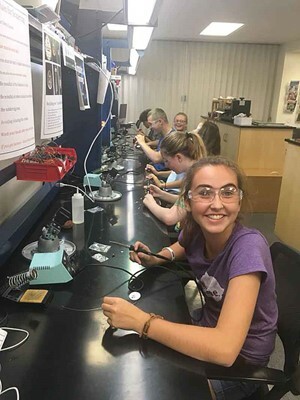 The students receive career counseling beginning in ninth grade and are exposed to learning opportunities outside the school through trips during the school year. “The structure and unique opportunities offered at iLEAD create a catalyst for deep discussions and brainstorming concerning life and career choices,” the iLEAD teachers wrote. The goal of iLEAD is to graduate its students with a high school diploma and an associate degree from Jefferson Community and Technical College. Of the 33 juniors at iLEAD, 31 are enrolled as college students at JCTC. 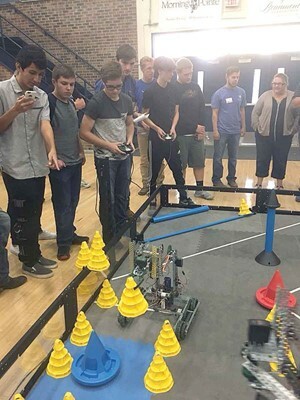 Students visit several higher education campuses in the state where they can explore future college major options, including health care and engineering. iLEAD hired a student advocate to help students map out how to transfer the associate degree into a bachelor’s degree. Owen County school board member Neese Chilton has a daughter who is a junior at iLEAD Academy. • Access the best instructional programs aligned to their career interests and accelerated career pathways with seamless transitions from high school to postsecondary studies. • Learn and progress at their own pace, master content and progress without regard to time in a seat or months in a school year in a fully competency-based educational program. • Exert control over the place, time and pace of their education in a blended learning program. • Jumpstart college studies to enter the workforce after high school at a higher wage and level of experience or complete a bachelor’s degree in two years after high school. • Integrate technical courses into learning at all levels. • Pursue a broad variety of foreign language studies utilizing digital learning platforms. KSBA began the PEAK Award in 1997 and has given out the PEAK Award 46 times over the past two decades. In the January issue of the Kentucky School Advocate, we will revisit a few of the past winning programs to update how they have evolved since winning the award.